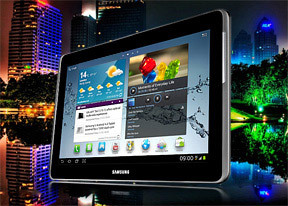 The Samsung Galaxy Tab 2 10.1 comes with Android 4.0 Ice Cream Sandwich out of the box and some useful pre-loaded apps, with TouchWiz supplying a familiar set of interface customizations. Before we begin here is a video demo of the user interface in action. The Ice Cream Sandwich interface is similar to Honeycomb, so you'll feel right at home if you're upgrading from an Android 3.x tablet. The lockscreen shows you the time and date and the status bar at the bottom remains visible, so you can still see network status and new notifications. Unlocking it is very easy - just tap anywhere on the screen and drag your finger out of the circle. You get five homescreen panes and you can't add or remove any. In the top left corner you have shortcuts to Google search (both text and voice), while the top right corner holds the app drawer shortcut. There's the status row at the bottom. It contains the usual Back, Home and Task manager on-screen keys, but Samsung have added an always visible screenshot key. When you snap a screenshot, the Galaxy Tab 2 10.1 automatically launches an app that lets you scribble some notes on the image. Also located on this bottom row is the notification area. It has the connectivity toggles that we've come to know from the smartphone edition of TouchWiz. They offer more functionality than the stock Honeycomb quick settings - including GPS, Wi-Fi, Sound, Mobile data and Sync. The app launcher has seen no modifications at all, but there are plenty of preinstalled apps that cannot be found on other tablets - Social Hub, Music hub, Pulse reader, AllShare, Polaris Office, Video player and editor and My files. Some of the other apps like the music player and the calendar have been modified as well. Despite its size, the Samsung Galaxy Tab 2 10.1 features full voice-call support. It will even do 3G video calls with the front-facing VGA camera. You could (and should) use the loudspeaker or a headset to make your calls. Picking a contact to call is fairly easy - you have smart dial, a call log if you need to call someone back and Favorites, which display large tiles with the photos of your favorite contacts. Voice dialing is enabled too. Contact management is straightforward on the Samsung Galaxy Tab 2 10.1. Your contacts get automatically synced with your Google account (other accounts too, as well as social networks and so on) unless you explicitly disable this feature. Contacts are displayed using a two-column interface that's present in several other key apps and really puts all the screen real estate to good use. The left column lists all the contacts, with the contact info on the right. From here, you can easily send messages and emails, call contacts and view the wealth of info stored in the phonebook. You can join contacts, which comes in handy when you install Facebook, Skype, etc. The messaging app layout is similar to the phonebook - on the left you get the threads, on the right are the messages in each thread. There's an application-specific search that lets you quickly find a given message among all your stored SMS and MMS. The Galaxy Tab 2 10.1 comes with two email applications out of the box - one for your Gmail and one to use with any POP3/IMAP account. They both use the same split-screen interface. Initially, your folders are listed on the left and the emails in the currently selected one appear on the right. Upon clicking on an email the list of emails moves to the left tab while the body of the selected one pops up on the right. Bulk actions are supported too, so you will easily manage mailboxes that get lots of traffic. You can set up the automatic email retrieval interval or you can disable that completely and check mail manually. There's also a handy setting that makes your client automatically download attachments only when you are connected over Wi-Fi. Writing emails is reasonably comfortable with the virtual QWERTY keyboard taking about half of the screen. The tablet is too big for the landscape keyboard to be used comfortably (your hands have to hover over the screen), but if hold it vertically, you can type easily with two thumbs. There's auto correction and auto capitalization available and you can enable sounds on key presses. There's haptic feedback too - the slate vibrates exactly where you've tapped.